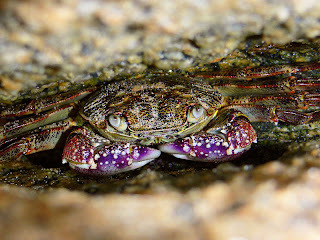 The purple shore crab Leptograpsus variegatus of the southern subtropical Indo-Pacific ocean. Photo by Benjamint444. When I was but an ickle lad, and my family would camp over Christmas at the beach by the estuary beneath the house of my great-grandparents, I would spend many hours turning over rocks and catching the crabs that I found underneath them. The most common variety I would find was the tiny grey-brown mud crab (Helice crassa), which could be handled easily, but if I managed to turn over one of the really big rocks then I would be able to find the larger purple shore crabs (Leptograpsus variegatus), which required a more careful approach lest they inflict great pain. One thing I didn't know at the time about either animal, however, was that they were both members of the superfamily Grapsoidea. Grapsoidea is a grouping of crabs including at least seven families. The classification of Grapsoidea is currently undergoing something of a revision, and has shifted about a little in recent years. While most grapsoids were once included in the single family Grapsidae, the recognition of the latter as paraphyletic to the Gecarcinidae has lead to the elevation of the various prior subfamilies of Grapsidae to separate families. The family Glyptograpsidae was only established in 2002 (Schubart et al., 2002), while the genus Xenograpsus was moved into its own family within the past year (Ng et al., 2007). Other families in the group are Sesarmidae, Varunidae and Plagusiidae. The majority of grapsoids are found on the shoreline, but some (such as the Chinese mitten crab Eriocheir sinensis) move into fresh water. At least one genus, Planes (Grapsidae), is pelagic, while Xenograpsus has been found to depths of 270 m (McLay, 2007). Xenograpsus is found in association with hydrothermal vents, and populations of X. testudinatus living on sulphur vents near Taiwan make their living by feeding on the rain of dead zooplankton killed by toxic discharges from the vents (Ng et al., 2007). 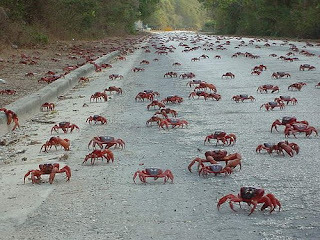 Gecarcoidea natalis, Christmas Island red crab migration. Photo from here. Some members of the Gecarcinidae live their adult lives terrestrially as adults on tropical islands. Nevertheless, all grapsoids (as far as I can tell) retain the ancestral state of marine planktonic larvae, so all terrestrial gecarcinids must return to the coast to spawn. 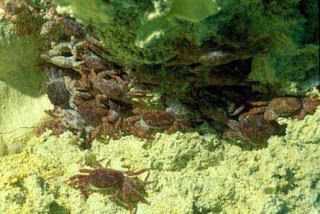 The Christmas Island red crab, Gecarcoidea natalis has become renowned for the vast numbers that can be seen in its mass migrations, as the entire island's population of crabs (more than 40 million when estimated in 1995 - Adamczewska & Morris, 2001) moves down to the coast over the course of a week or so. Tragically, recent years have seen a population explosion on Christmas Island of the introduced yellow crazy ant* (Anoplolepis gracilipes), which was estimated to have killed off some 15 million-plus crabs by 2003 (O'Dowd et al., 2003), and has essentially eliminated crab populations wherever it has established colonies. Foraging crabs are attacked in large numbers by crazy ants defending their nests, and poisoned with large amounts of formic acid. Crazy ants will also occupy crab burrows, removing their former inhabitants with extreme prejudice. Not only are resident crabs killed, but crabs migrating from elsewhere have been destroyed as they crossed crazy ant-infested locations on their way to the coast. Where red crabs have been eliminated, the forest vegetation structure has begun to change significantly, as seedlings that would have once been grazed by crabs are able to establish a dense undergrowth. *So called because of the seemingly random way in which they wander about when foraging. Xenograpsus testudinatus at the base of a sulphur vent. Photo from here. The Grapsoidea are closely related to another shore-crab family, the Ocypodoidea, and apparently species included in these two superfamilies were once united (back in the 1800s) under the taxon name Catometopa (Schubart et al., 2006), a name that I think deserves resurrection (just try saying it a couple of times - "Catometopa!"). While it seems to be universally accepted that these two superfamilies form a clade, the molecular phylogenetic analysis of Schubart et al. (2006) indicated that each of the "superfamilies" was polyphyletic within this clade, and recommended that they not be recognised as distinct. So far, I haven't been able to find what are the characters that are supposed to separate the two groups. Davie & Ng (2007) stated that morphological data maintained the monophyly of Grapsoidea, but omitted to cite any details in support of this statement. Adamczewska, A. M., & S. Morris. 2001. Ecology and behavior of Gecarcoidea natalis, the Christmas Island red crab, during the annual breeding migration. Biological Bulletin 200: 305-320. Davie, P. J. F., & N. K. Ng. 2007. Two new subfamilies of Varunidae (Crustacea: Brachyura), with description of two new genera. Raffles Bulletin of Zoology Supplement 16: 257-272. McLay, C. 2007. New crabs from hydrothermal vents of the Kermadec Ridge submarine volcanoes, New Zealand: Gandalfus gen. nov. (Bythograeidae) and Xenograpsus (Varunidae) (Decapoda: Brachyura). Zootaxa 1524: 1-22. Ng, N. K., P. J. F. Davie, C. D. Schubart & P. K. L. Ng. 2007. Xenograpsidae, a new family of grapsoid crabs (Crustacea: Brachyura) associated with shallow water hydrothermal vents. Raffles Bulletin of Zoology Supplement 16: 233-256. O'Dowd, D. J., P. T. Green & P. S. Lake. 2003. Invasional 'meltdown' on an oceanic island. Ecology Letters 6 (9): 812-817. Schubart, C. D., S. Cannicci, M. Vannini & S. Fratini. 2006. Molecular phylogeny of grapsoid crabs (Decapoda, Brachyura) and allies based on two mitochondrial genes and a proposal for refraining from current superfamily classification. Journal of Zoological Systematics and Evolutionary Research 44 (3): 193-199. Schubart, C. D., J. A. Cuesta & D. L. Felder. 2002. Glyptograpsidae, a new brachyuran family from Central America: larval and adult morphology, and a molecular phylogeny of the Grapsoidea. Journal of Crustacean Biology 22(1): 28-44. IHNTA, I just want to say that I love this blog. Love it. Okay, one question: I see that the awesome coconut crab, Birgus latro, is not a grapsoid. So, the crabs have invaded the land multiple times? I vaguely recall that this is supposed to be a recent adaptation -- the earliest fossil land crabs are from the Eocene or so. Also: while I don't know a thing about grapsoids, I do know that B. latro has a whole suite of highly derived adaptations to life on land, including significant changes to the kidneys (of course), the endocrine system, and the shell. Most intriguing of all, B. latro has independently evolved a lung: part of the shell has become fractally intervaginated, like a baklava, an has also developed a "bubbly" interior surface that looks for all the world like tetrapod alveoli. The shell is still your standard arthropod chitin, but the indivudual layers have become so thin that oxygen can diffuse freely through it. The crab expands and contracts its shell to "breathe", and will cycle this faster -- "panting" -- when stressed. It grew a lung from its shell. God, I love that. It's like evolving a kidney from fingernails, you know? Anyway: just wondering if the grapsoids are a separate convergent evolution to life on land, and if so what adaptations they might show. Land-living grapsoids are certainly independent of coconut crabs - grapsoids belong to the Brachyura (true crabs), while coconut crabs and hermit crabs belong to the Anomala, a separate radiation of crab-like animals that may have developed its crab-like form independently of the brachyurans. Also, while I haven't looked up the details, I got the impression that terrestriality may have evolved more than once among the grapsoids, as terrestrial grapsoids include members of different families. Apparently, the brachyuran land crabs do have enlarged branchial cavities to aid in respiration, but they would have to keep them permanently moist, as would the coconut crabs. I wonder if it may not be a coincidence that land crabs seem to have been more successful in island environments, where they may be under less predation pressure than on continents. Apparently, land crabs also tend to have shortened larval development periods, so the young are able to return to land more quickly. Anger, K. 1995. The conquest of freshwater and land by marine crabs: adaptations in life-history patterns and larval bioenergetics. Journal of Experimental Marine Biology and Ecology 193 (1-2): 119-145. Burggren, W. W., & B. R. McMahon (eds.) 1988. Biology of the Land Crabs. CUP Archive. Farrelly, C. F., & P. Greenaway. 1993. Land crabs with smooth lungs: Grapsidae, Gecarcinidae, and Sundathelphusidae ultrastructure and vasculature. Journal of Morphology 215 (3): 245-260. 1) There seems little question that B. latro, at least evolved on islands. It does not do well in environments with large tetrapod predators. Coconut crabs can see off rats without difficulty, and aren't very vulnerable to cat predation, but dogs and pigs can crunch through their shells and finish them off quickly. There's a very tight correlation between how common they are and the presence/absence of feral dogs and pigs. That said, it's worth noting that a few coconut crabs may turn up even on mainland shores with lots of large tetrapod -- and human -- predators. There's some evidence that the crab can adapt its behavior to predator-rich environments, becoming more timid, cryptic, and even partially fossorial. Anyway: B. latro is indigenous to the Indo-Pacific, but molecular date suggests an origin in island-rich (and land-predator poor) Polynesia. 2) The shortened larval span makes sense; you don't want your larva dispersing to open ocean. It does make you wonder what a fully landgoing crab would be like... would they develop hard-shelled eggs like amniotes, or carry the larva around with them like some frogs, or something else entirely? 3) Lungs: my understanding (which may be wrong) is that B. latro is unique in the size and complexity of its respiratory system. It has a fully developed lung and a large, powerful heart. -- I especially like the one about how B. latro has evolved an olfactory system much more like an insect's than a crab's! No, not all Grapsoids have unspecialized reproduction with pelagic larval stages in the sea. In the Sesarmidae the entire genus Geosesarma are frssh water crabs with direct development, e.g. the females carry their eggs below their pleon until they hatch as mini crabs. Also in the American genus Sesarma exist some species which have a shortened or direct development in fresh or brackish water (You can find references at Christoph Schubarths papers).